This is the fifth album release from the Hastings-based husband and wife folk duo. While previous album ‘Expatriot’ benefited from the input of renowned record producer and recording artist, Ethan Johns, who also provided recording facilities and production values from his home base in Wiltshire, this time out they decided to strip everything back – recording ‘Fair Lady London’ on an old Tascam 4-track recorder in a castle in East Sussex – preferring the ‘head space’ of such an arrangement over the somewhat fussy environs of a studio. ‘Fair Lady London’ begins with the personification of London as a woman who’s seen better days – “your skin’s grown pale, your eyes are now sunken.” While there’s no apparent unifying theme to much of the material on the album, there’s a melancholic undertow to some of the songs, with relationship travails a recurring motif, not only to depict the decay of a partnership on the title track, but also the lament of a path not taken on ‘We Should Have Gone Dancing.’ The couple are rightly renowned for their mesmerising dual turns at a shared microphone, with Hannah Lou’s rising intonations a particular highlight throughout the record. Stand out songs on an album where the quality never really drop are the jaunty ‘Minds On The Run,’ while the bright melody of ‘I Could Break You’ masks its darkly lyrical subject matter, recalling the brilliance of Clive Gregson and Christine Collister’s ‘I Specialise’ – both songs a whimsical study in how a woman can wreak wanton destruction on a lovelorn male at the drop of a hat. 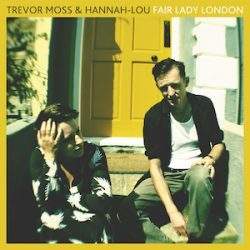 With this release, Trevor Moss and Hannah Lou might develop some renown for a DIY work ethic when it comes to recording, but there’s nothing amateur sounding about the professionalism of this highly crafted effort, whose songs and melodies are destined to live long in the memory.